Golf tournament ideas: Everything from unique golf contests, ways to promote your event, goodie bags, save the date cards, and more. When insuring a vehicle at your golf tournament, you’ll want to have the dealership you’re working with, drive the vehicle that’s being offered out to the course. As for which hole to place the vehicle on, it all depends on which one is being insured! Just make sure that the hole is a minimum of 135 yards in length. For more information on any of our golf contests, or questions regarding vehicle placement for maximum sponsorship value, feel free to give Hole In One International a call at 800-827-2249. You’re also welcome to email us for assistance! P.S. Wanting to insure a golf contest that’s not at a golf course? No problem! Odds On Promotions, our sister company, has a variety of different golf contests to choose from which can take place any time, anywhere! Golf Contests Between the 9s: A Great Idea! Having trouble deciding whether you should hold your insured putting contest or million dollar shootout contest before or after your golf tournament? Don’t feel that you have the time for any golf contests before or after the golf outing? If the answer is ‘yes’ to either of those questions, then you’ll definitely want to consider having your players qualify, or even participate, in your golf contests “between” the 9s. After players finish playing the 9th hole on the golf course, have them gather ’round for a chance to sink a 50-foot or longer putt or score a hole in one with one of our various golf contests! It’s the perfect opportunity to qualify your contestants during this time; otherwise, have them pre-qualify prior to the golf tournament and hold the actual golf contests during that time. The choice is strictly up to you! If you have any other questions about holding golf contests “between the 9s”, don’t hesitate to give Hole In One International a call at 800-827-2249. You can also email us with any questions! Now here’s an idea you may not have thought about before: golf tournament surveys! How did you enjoy the golf course? Did you find it too easy, too challenging or just right? Would you be willing to travel to play a new course? If so, how far? Do you prefer to play golf on a public golf course or a private country club? What day of the week is most ideal for you to participate in golf outings? Do you feel that we offered enough various contests and activities throughout the day? Were the food and beverages offered during the day of the golf tournament adequate? Passing out golf tournament surveys to each and every player/attendee at the end of your golf outing is also a great way to gather referrals — whether they be golfers or volunteers — by asking them to list people that they would like for your committee to contact in the future regarding any future golf tournament events! The more leads the better, right? For more ideas on creating golf tournament surveys, feel free to give Hole In One International a call today at 800-827-2249… or email us at any time. 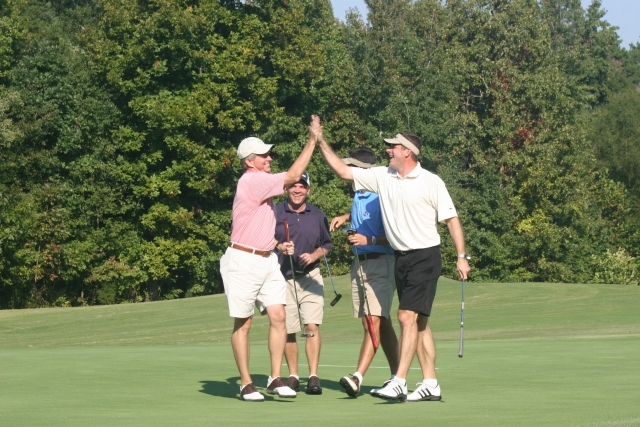 We’re here to help when it comes to help making your golf tournament a success! Want to give your tournament participants and volunteers a way to remember your golf outing for years to come? Then be sure to take as many photos and videos as possible before, during and even after your event! Just make sure they’re quality photos/videos. Wondering how to ensure that they are? Hole In One International is here to explain how to make the most out of your visual memories and provide you with some great ideas! Make sure you pay attention to what you’re taking photos of! (This may seem elementary, but truth be told we see a lot of photos of scenery and beverage carts.) While these types of photos are okay to have, it’s still important to focus on your main subject: your tournament participants! Be sure to gather some great action shots of your players, individual photos and team/foursome photos. Have your designated photographer (if applicable) drive around in a golf cart and take some unique photos. Also be sure to take photos of any contest winners you happen to have! If/when hole in one insurance is included in your outing, be sure to take a photo of any winners you have next to the prize they’ve won, if it happens to be out on the golf course; otherwise, have them stand by the appropriate signage on the hole that shows what they’ve won! Be sure to take footage of your golfers throughout the duration of your outing. Put together a ‘collage’ of sorts to share at your awards ceremony and sell to participants (as well as to use to promote the next event). It will make for plenty of laughs – especially if you manage to catch some footage of any golf follies, such as a player being stuck in an inescapable sand trap or a player’s ball landing straight into a water hazard. Depending on the amount/quality of video equipment available at your golf tournament, you can also station the video cameras on a specific hole on the course and video each golfer playing that particular hole. Or, if you have the time, you can even video each golfer’s performance from start to finish and possibly sell a video of their performance to them. Looking to give your sponsor(s) additional exposure? Feel free to include any necessary commercials in the video as well. Need more photo/video suggestions? Feel free to give Hole In One International a call at 800-827-2249… or email us, and we’ll be sure to help you out and give you more pointers!